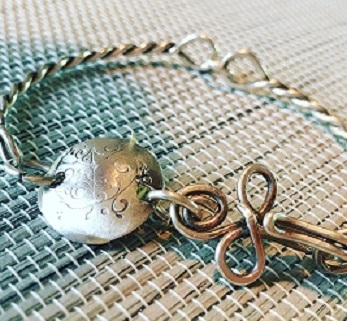 Soldering, hammering, twisting, jump rings, jigs, annealing, disc cutting, dapping, doming, stamping, finishing...Natalie’s most cram-packed jewelry course in a single bracelet! Use the Grow Peace stamp, the hallmark of Joe’s Garage for this project! Choose sterling or copper at registration. Materials included. Ages 18 and up or 14-17 with adult.